Isn't it just a gorgeous morning? The sky is blue and all appears happy in my little bit of the world! You getting up to anything fun this weekend? I have to take my camera in for fixing (yes something else has gone wrong...oh the joy of technology). I've got a ColourQ challenge today. I've gotta admit I wasn't initially taken with the combo but the more I looked at it and pondered on it, the more I realised how much I liked it. Plus its quite different to the colours I'd naturally reach for. 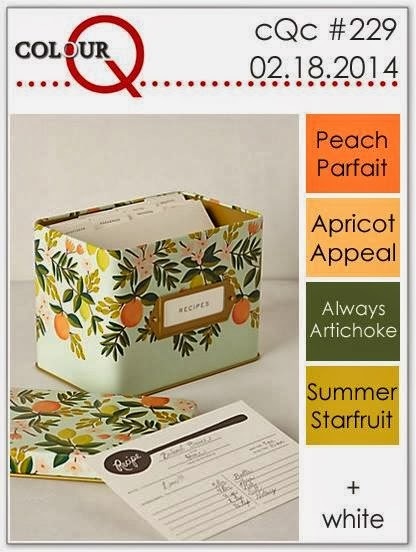 I was pleased to get to use my Peach Parfait ink again - I loved that shade of orange and really sad its not current anymore but I've hung on to my ink pad and pen....plus I've still got some cardstock kicking around. I actually really wanted to make a card with Peach Parfait as the cardbase but it just didn't look right in the end. I don't have Apricot Appeal so substituted for Crisp Cantaloupe which turned out to work pretty well with the other colours. I also found a new challenge site called The Card Concept - the twist to this challenge is you have to categorise your card's style. Mine is Simple & Layered. 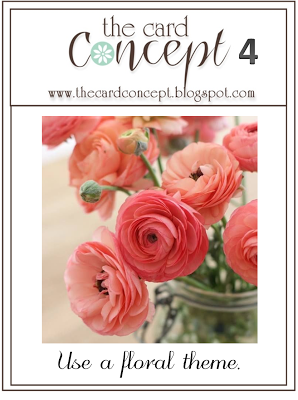 Card Concept has a theme this week which is floral which seems to fit in perfectly with this card. And here's my simple, layered, floral creation. So I've kept this card quite clean and simple, it was a bit of a struggle to leave all that white space as is but I just had to tell myself, no, it looks good, anything else would be overkill! 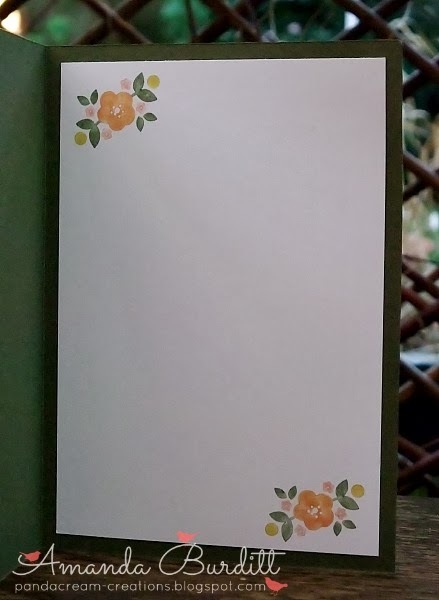 I used the Stampin' Write markers to colour the cute floral stamp in all those yummy colours and made my own faux pattern paper border along the bottom. 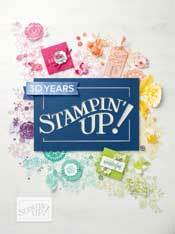 The little strip of card is just covering a little bit of not so good stamping - hooray for cover-ups! I stamped the flowers in artichoke on the card base for a little texture as it was looking very flat and boring without it. Again I used the markers for colouring in the sentiment and took the time to colour in all the flowers in "you" - I think it just makes the sentiment that extra bit more fun and adds a pop of colour. To add a little lift to the decorative label punch I punch the top and bottom portions of the decorative label on artichoke and layered it just that little bit for a little border - love getting more uses out of punches!! Finally, the inside was really dark so I added some white card for easier writing and just a little stamping to make it as pretty as the outside! Do you like this colour combo? Let me know what you think! Love these warm vintage-feeling colours! Thanks so much for joining us at the Card Concept! 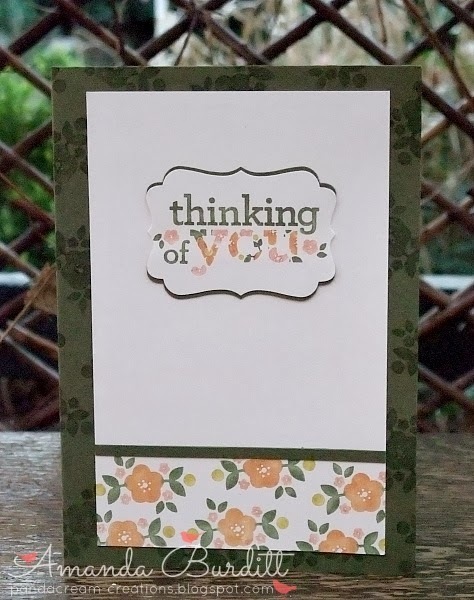 Pretty inside and out, love the framed sentiment and the details with all of the colours you used! 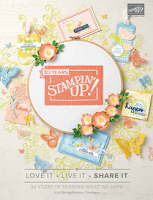 Love the way you've done the inside too and and how you've stamped the sentiment! Such a lovely detail. Thanks for joining us at Colour Q this week! A very pretty soft card. Such lovely colours you have used. 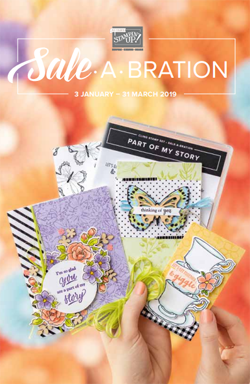 Thank you so much for joining us at The Card Concept. This card is very sweet!